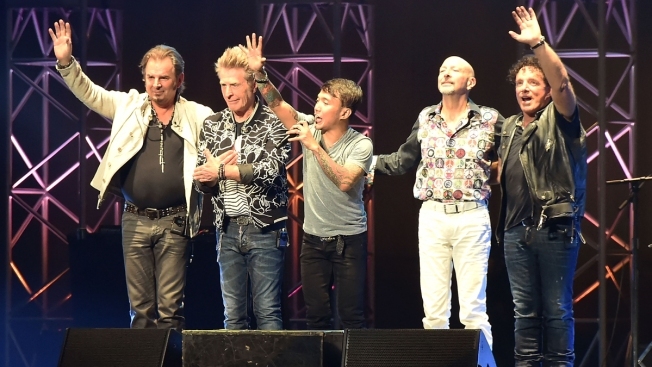 FILE - (Left to right) Musicians Jonathan Cain, Ross Valor, Arnel Pineda, Steve Smith and Neal Schon of Journey perform live, Feb. 7, 2017, in Tokyo, Japan. Is legendary Bay Area band Journey set for a breakup soon? That's the question many on social media are now trying to tackle after founding Journey guitarist Neal Schon blasted fellow band members for visiting the White House and meeting with President Donald Trump. Band members Arnel Pineda, Jonathan Cain and Ross Valory made the visit last week, which Schon claimed on social media he had no idea about before it happened. Schon, who has been with the band since 1972, has said Journey's credo has always been the music it creates is for "everyone." The guitarist also points out the trio who made the White House visit knows his position. "This clearly shows no respect or Unity...just Divide," Schon said in a social media posting. On Monday, Schon in a tweet denied he is leaving the group. He did, however, mentioned tensions in the group have been running high for close to two years.